Here is an original photo of Mets outfielder Michael Conforto signing autographs at Comerica Park in Detroit. The glimpse was provided by Lance Martinez of My Detroit Sports. Conforto was called up by the Mets in late July of last season and played very well throughout the team’s march to the World Series. During the 2015 Fall Classic, he hit two homeruns in Game 4, becoming the third youngest player to accomplish that feat. 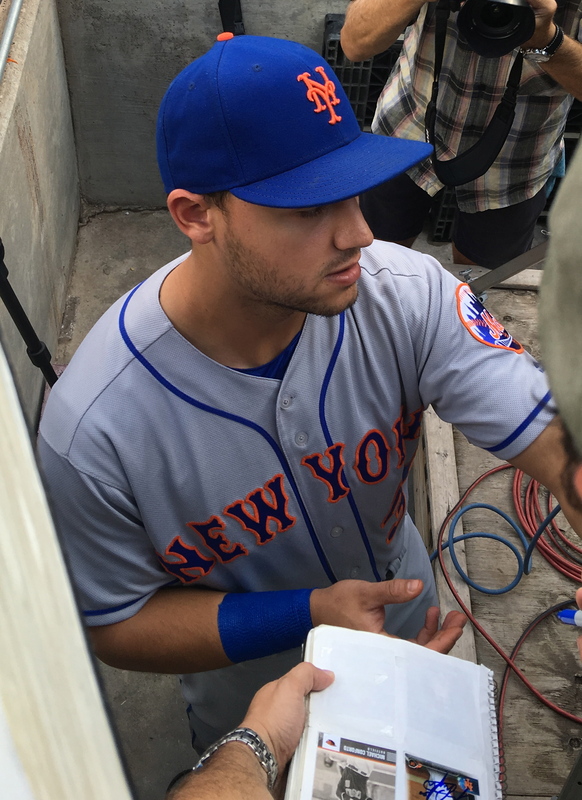 2016 has not gone as well for Conforto, as he has spent a good amount of time with the Mets Triple-A affiliate, the Las Vegas 51's, after struggling in two separate stints with New York. In 266 MLB at-bats this season, the Seattle native is hitting just .218, with 11 HR and 33 RBI. The lefty hitter will once again join the big club when rosters expand on Thursday. Mets fans can also view other behind the scenes original stories, chronicling the team over the past few years.